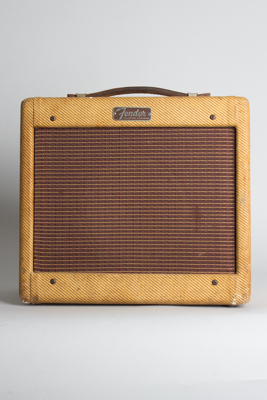 Fender Champ-Amp 5F1 Model Tube Amplifier (1960), made in Fullerton, California, serial # C-14494, tweed fabric covering finish. Height is 12 in. (30.5 cm. ), 13 1/2 in. (34.3 cm.) width, and 8 in. (20.3 cm.) deep. This is a nicely original later tweed Champ from 1960, just maintenanced and sounding great. Recent service included a grounded plug, a full cap job, and re-biasing to spec. No circuit changes have been made -- in fact, this amp appears to not have been previously serviced since new. It has a tube-chart stamp "JG" dating to July 1960 and retains the original transformers and speaker. Externally the tweed is solid; somewhat dirty, but not heavily worn, with a couple of old paint spots. The original leather handle is still intact and the faceplate shows only minor corrosion. Yet another great-sounding tweed Champ, a perennial favorite amp -- small in size but a monster in tone! Overall Excellent - Condition.